§ 297-320 Signs requiring neither permit nor payment of a fee. § 297-322 Signs requiring permit but no fee. § 297-324 Standards for specific types of signs. § 297-326 Maintenance of signs and permits. § 297-328 Real estate signs. The intent of this article is to conserve the natural, landscaped and improved scenery; encourage and protect the appropriate use of land, buildings and structures; regulate and restrict unsightly and detrimental signs tending to depreciate the values of property and hinder progressive improvements in Charles County; and lessen, eliminate and regulate signs constituting an actual or potential hazard to safe motor vehicle operation and general traffic on the highways and to encourage the effective use of signs as a means of communication in the County, to maintain and enhance the aesthetic environment and the County's ability to attract sources of economic development and growth, to encourage unified signage in shopping areas and streetscapes and to enable the fair and consistent enforcement of these sign regulations. It is hereby determined that regulation of the location, size, placement and certain features of signs is necessary to enable the public to locate goods, services and facilities without difficulty and confusion, to prevent wasteful use of natural resources in competition among businesses for attention, to prevent hazards to life and property, to assure the continued attractiveness of the community and to protect property values. It is further determined that signs which may lawfully be erected and maintained under the provisions of this article are consistent with customary usage and that signs which may not lawfully be erected or maintained under the provisions hereof are not consistent with customary usage, are an abuse thereof and are unwarranted invasion of the rights of legitimate business interests and of the public. This Sign Ordinance is adopted under the zoning authority of the County in furtherance of the more general purposes set forth in this article. Signs in the Planned Unit Development (PUD) Zone. Signs located in the Planned Unit Development (PUD) Zone shall be exempt from the normal requirements of this article. The number, placement, height, size, illumination and all other requirements for signs within the PUD Zone shall be approved by the Planning Commission or its designated representative. The application for a sign permit shall be submitted in such form as the Zoning Officer may prescribe and shall be accompanied by the required fee, where applicable. The Zoning Officer shall review and approve the sign permit(s) which addresses the design, construction material, location and method of illumination, if any, for all proposed signs at the time of permit application and may, at its discretion, require changes in any or all of the aforementioned categories before issuance of a permit. For signs located in the planned unit development (PUD), approval from the appropriate Planning Design Review Board (PDRB) must be received prior to applying for a sign permit. Any permit issued shall become invalid and void if the authorized work is not completed within six months of the issue date. The Zoning Officer, upon a determination of reasonable cause, may grant an extension of a sign permit. Subject to the approval of the Zoning Officer, amendments to the sign application or other records accompanying the same may be filed at any time before completion of the work for which the permit is sought or issued and, such amendments shall be deemed part of the original application and shall be filed therewith. A Charles County sign permit shall be issued to the person or firm erecting the sign or sign structure. The Charles County sign permit shall be kept with other pertinent documents which belong to the person or firm to whom the permit was issued. The sign permit shall be made readily available to the Zoning Officer. Upon completion of the sign, the holder of the permit shall contact the Department of Planning and Growth Management and request an inspection of the sign. Any deviation from the approved plans and permit shall be noted, and the holder of the permit shall be notified of discrepancies. Except as otherwise provided in § 297-321, no sign may be constructed, erected, enlarged, illuminated or substantially altered except in accordance with the provisions of this article and in accordance with a sign permit issued by the Zoning Officer. Repainting a sign shall not, in and of itself, be considered a substantial alteration. Sign permit applications and sign permits shall be governed by the same provisions of this article applicable to zoning permits. The County shall be responsible for enforcing only the provisions of this article and not the provisions of any private third-party agreement, allocation formula, lease or other private restrictions. All signs shall meet the construction requirements of the Charles County Building Code. Signs shall not obstruct any window, door, fire escape, stairway or any opening intended to provide air, ingress or egress for any building or structure. Editor's Note: See Ch. 224, Building Construction. Upon issuance of a sign permit for a permanent pylon sign, a building permit will be obtained by the owner of the sign or the contractor prior to its construction. The sign and sign structure will then be inspected by a Charles County Building Inspector to ensure its compliance to the Building Code. Removal of illegal signs. Failure of the owner of an illegal sign to remove the sign within 10 days of receipt of written notice of violation by the Zoning Officer may result in the removal of the illegal sign or legal action by the County at the owner's expense. A temporary sign permit may be renewed by the Zoning Officer. Failure to remove a temporary sign within one week after the permit expiration date shall subject the owner of the sign to the penalties provided in this article, and the temporary sign may be immediately removed by the County at the owner's expense. For the purpose of a special promotion or event, businesses shall be allowed the use of not more than one on-site portable sign or banner, provided that neither shall be flashing, blinking, inconstantly illuminated, animated or moving, unsafe to traffic or pedestrians or affixed to any vehicle. Display of temporary signage on a premises shall be limited to once every three months for a period not to exceed 30 consecutive days. Approval for special event signage must be granted by the Zoning Officer at least seven days in advance of its public display. Special event banners and portable signs are not to exceed 32 square feet in area. This subsection does not apply to those event signs enumerated in § 297-325. Outdoor advertising signs, excluding those signs enumerated in § 297-325. The erection or construction of new outdoor advertising signs and billboards of any size are prohibited. Any existing outdoor advertising sign shall be properly removed if damaged or destroyed in excess of 50% of the estimated expense of the reconstruction costs. The removal of outdoor advertising along rights-of-way of the federal-aid primary system of highways in Charles County shall be regulated in accordance with the Transportation Article of the Annotated Code of Maryland and the United States Annotated Code, Title 23. Obsolete signs. Any sign which has become obsolete because of discontinuance of the business, service or activity which it advertises, removal from the location to which it directs, abandonment, neglect or for any other reason, shall be removed from the premises within 10 days of written notice to the property owner. If an obsolete sign is nonconforming, see § 297-327. Unsafe signs. When any sign becomes insecure, in danger of falling or otherwise unsafe, the owner thereof or the person or firm maintaining the same shall, upon written notice of the Zoning Officer, immediately and, in any case, within not more than 10 days, make such sign safe in conformity with the Charles County Building Code or shall remove it. Adverse and unsafe illumination signs. No illumination or glare from any sign shall emit itself onto any public highway, roadway or right-of-way so as to adversely affect the safe and efficient movement of vehicles thereon. Special exception uses. Any use in a residential zone which requires a special exception from the Board of Zoning Appeals may be allowed a maximum of 32 square feet of signage for the permitted use. Political campaign signs. Political campaign signs are permitted in all zones. In residential zones, political campaign signs shall not exceed 32 square feet in area and shall not be illuminated. Political campaign signs shall be confined to private property and shall not be affixed to any public structure. Signs identifying the name of the property and/or residents thereon. Such signs shall not exceed three square feet in area. Signs having an area of not more than eight square feet each, the message of which is limited to warning of any danger, prohibition or regulation of the use of property or traffic or parking thereon. Signs erected by or on behalf of or pursuant to the authorization of a governmental body, including legal notices, identification and information signs, and traffic, directional Ag tourism or regulatory signs. The erection or maintenance of a sign designating the location of a transit line, a railroad station or other public carrier when not more than three square feet in area. Temporary special decorative displays, without commercial advertising, used for holidays, public demonstrations or the promotion of civic welfare or charitable purposes. A sign identifying an approved automobile inspection station, in accordance with the requirements of the State of Maryland Vehicle Administration, not exceeding 16 square feet in area. Such sign shall contain no advertising of services or products at its location. Signs not exceeding four square feet in area, securely attached to a gasoline pump, stating the price and octane of gasoline at the service station. Signs attached temporarily to the interior of a building window or glass door. Such signs, individually or collectively, may not cover more than 25% of the surface area of the transparent portion of the window or door to which they are attached. A temporary sign without illumination, on-site, and not exceeding 32 square feet in area advertising the sale of farm livestock or farm products produced on the premises. Signs within an enclosed structure, and not visible from the exterior of the building. Flags or insignia of any governmental or nonprofit organization when properly displayed. This does not include company flags or pennant signs. Nonprofit flags may only be displayed on the premises of the nonprofit. Signs directing and guiding traffic on private property that do not exceed four square feet each and that bear no commercial message. Homeowner association signs stating time and place of homeowner association meetings. Any Ag tourism farm that meets the definition contained in this chapter is allowed up to three off-site directional signs to direct the traveling motorists to their farm. These signs will be designed, constructed and sized in accordance with Appendix K of this chapter. Editor's Note: Appendix K is included as an attachment to this chapter. These signs will be located within the road right-of-way in accordance with Appendix K. Where it is not possible to locate these signs in the road right-of-way, signs may be placed on private property with permission of the property owner. Permitted only on weekends (Saturday and Sunday), state and federal holidays, and during prescheduled special events of a specified duration. They shall not be placed in any right-of-ways, sight distance easements, or in locations which obscure any traffic signage. They shall not float any higher than the building height of the business. They shall be securely attached to ensure that they are not released and create any type of hazard to passing traffic. The balloons must be reused or disposed of properly and shall not be displayed after sunset. They shall not be attached to any existing signage or light poles on the property. Each individual balloon shall not exceed 20 inches in diameter and shall not be illuminated. Signs which interfere with the view necessary for motorists to proceed safely through intersections or to enter onto or exit from public streets or private roads. Signs which, by their location, color, size, shape, nature, or message may obstruct the view of or be confused with official traffic signs or other signs erected by governmental agencies. Signs that revolve or are animated or that utilize movement or apparent movement to attract the attention of the public. This includes, but is not limited to, three-dimensional models, pennants, and propeller discs. Signs or devices, including searchlights, spotlights and holograms, which contain or are illuminated by flashing, chasing, or intermittent effects. Scrolling message boards may not change the message more than once every 10 seconds. This provision shall not prohibit time, date, and/or temperature signs that convey information by words, letter or numbers and which are not in motion and are changed not more than once every 10 seconds. Off-premises signs other than directional signs for real estate sales and event signs to include any sign mounted on wheels. Signs mounted to or painted on vehicles visible from the public right-of-way unless the vehicle is used for transport in the normal day-to-day operations of the business. Signs temporarily and or not securely mounted to vehicles. This does not include magnetic business identification signs, vehicle graphics or wraps. Commercial advertising signs permanently placed or erected in the bed of a truck or on the deck of a trailer or a truck. Signs that emit sound, vapor, smoke, odor, particles or gaseous matter. Signs within any government right-of-way except for official government signs, signs authorized by the appropriate government authority or directional signs erected in accordance with § 297-325G. Illegal signs erected in the government right-of-way may be removed by the County. An administrative fine of $25 per commercial sign may be assessed by the County against the person that places or maintains a sign within the right-of-way of the state or County. Promotional/special sale signs posted on machinery or equipment. The locking, painting, posting or affixing of signs, posters or banners of any kind or description on the walls of buildings, barns, sheds, trees, utility poles, posts, fences, rocks, walls or other structures is prohibited. The following signs shall be exempt from the provision of this subsection: signs identifying the name of property and/or residents thereof; temporary on-premises real estate signs; signs warning of any danger, prohibition or regulation of the use of property or traffic or parking thereon; and official government signs. Home occupation. 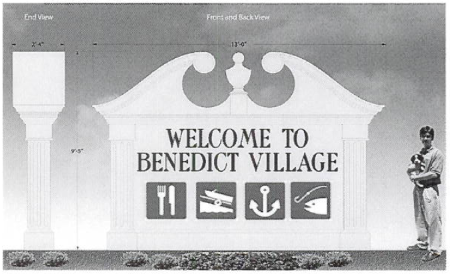 A nonilluminated sign not exceeding four square feet in area, attached flat to a building, to advertise home occupations. Directional or information signs. The following directional or information signs of a public or quasi-public nature in any zone, not exceeding 32 square feet in area. Such signs shall be without illumination or advertising. Signs stating the name and/or location of a private school, college, YMCA, YWCA, fairgrounds, church or other place of worship or the name or place of meeting of an official or civic body as the Chamber of Commerce, Rotary Club or Kiwanis Club. The village center must be designated by the Charles County Comprehensive Plan. One sign may be erected at each entrance off of a principal or arterial road to the village center. Be monument signs no taller than 10 feet and shall not exceed 120 square feet. Name the businesses located in the village center, or show universal highway use symbol. Not be permitted to advertise products, services or specials. Have only the universal highway use symbols. Signs are to be maintained and operated by a village center association. The following principles shall control the computation of sign area, sign height and total maximum signage allowed. Computation of area of individual signs. The surface area of a sign shall be computed by including the entire area within single, continuous, rectilinear perimeter of not more than eight straight lines, or a circle or an ellipse, enclosing the extreme limits of the writing, representation, emblem, or other display, together with any material or color forming an integral part of the background of the display or used to differentiate the sign from the backdrop or structure against which it is place, but not including any supporting framework or bracing that is clearly incidental to the display itself. If a sign consists of more than one section or module, all of the area, including that between sections or modules, except air space, shall be included in the computation of the sign area. With respect to two-sided, multi-sided, or three-dimensional signs, the sign surface area shall be computed as described in Subsection A(1) and (2) above by including the total of all sides designed to attract attention or communicate information that can be seen at any one time by a person from one vantage point. The sign surface of a double-faced, back-to-back sign shall be calculated by using the area of only one side of such sign, so long as the distance between the backs of such signs does not exceed three feet. The sign surface of a double-faced sign constructed in the form of "A" shall be calculated by using the area of only one side of such sign (the larger side if there is a size difference), so long as the angle of the "A" does not exceed 30° and at no point does the distance between the backs of such sides exceed five feet. The entire surface area of a canopy or awning shall be calculated if the canopy or awning is internally lit. Notwithstanding § 297-321 and in accordance with § 297-324A(8), a flag with company name and/or logo shall count towards total permitted freestanding signage. The height of a sign shall be computed as the distance from the base of the sign at normal road grade to the top of the highest attached component of the sign. Freestanding or pylon signs shall not be placed on a berm or other structure so as to artificially increase the height above the standards set in this article. Computation of maximum total permitted signage. The permitted sum of the total area of all individual signs for each sign holder shall be determined by road classification (see Figure XIX-1). Editor's Note: Figure XIX-1 is included as an attachment to this chapter. The applicant may divide the total permitted signage among the different types of signs allowed per road classification (see Figure XIX-1). Only one freestanding sign shall be erected. A shopping center, business park, or industrial park may have one freestanding sign. No freestanding sign(s) shall be permitted for individual enterprises located within or on the same lot with the shopping center, business park or industrial park. An additional freestanding sign may be erected on property with dual frontage on state and/or County highways. Freestanding signs shall be designed and constructed using materials so the sign is architecturally consistent with the primary structure/building being served by the sign. Freestanding signs shall be designed and constructed to ensure the support structure is properly screened utilizing similar building materials as the primary structure/building the sign is serving. All freestanding signs shall include the street address designation, for example: A sign serving an address for 5000 Crain Highway will have the designation of "5000." The street address designation shall be located so it is separate from the main portion of the sign. The character size shall be a minimum of six inches in height and located at approximate eye level with standard passenger vehicles. The total size of the address designation shall not exceed three square feet in area and will not count towards the maximum allowable sign area permitted under this article. The maximum height of a pole sign shall be determined by road classification (see Figure XIX-1). The maximum sign area shall be determined by road classification (see Figure XIX-1). The maximum height for a monument sign shall be determined by road classification (see Figure XIX-1). A freestanding canopy with a company's name and/or logo must keep signage flush with the surface with no projection off of the canopy. Tenant listings on freestanding signs shall be limited for use for retail or shopping centers. The maximum number of tenants allowed on an individual exterior freestanding sign shall be limited to six, including registered logos. The minimum size of individual characters/graphics on a tenant listing shall be 10 inches in height and all characters/graphics shall be uniform type font and color scheme. There shall be no more than one corporate/company flag on any parcel. The flag is not to exceed 60 square feet in size. The flag pole is not to exceed 50 feet in height. The maximum sign area for an "A" sign shall be six square feet. The maximum height for an "A" sign shall be three feet. The maximum width for an "A" sign shall be three feet. Must be located on the sidewalk or directly in front of the business. Buildings with multiple tenants and/or multiple stories: one sign shall be permitted to name the building. Those tenants with their businesses located on the ground level shall be permitted one sign for each customer entrance for their business. The minimum clearance from grade shall be eight feet. The maximum projection from the building shall be determined by the current Building Code. The minimum clearance from grade to the underside of the awning or canopy shall be eight feet. Signs cannot extend above or below the face of the awning or canopy. Seventy-five percent of any window must be left unobstructed. Any window greater than four feet in height or width may not have lettering, graphics or signs exceeding a total of four square feet in size. 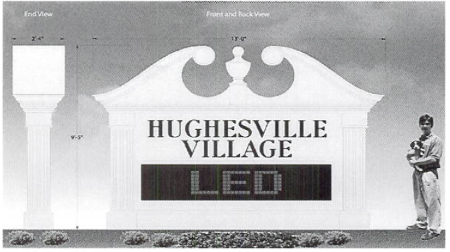 Illuminated "Open" signs are exempt from this; however, they may not exceed four square feet in size. Editor's Note: Former Subsection B(5), Corporate/Company flags, and B(6), "A" signs, which immediately followed this subsection, were repealed 5-1-2012 by Bill No. 2012-07. Event signs related to events held in Charles County, located at public facilities, including, but not limited to, County fairgrounds, parks and recreations, public schools, and County-owned properties, nonprofit facilities (VFD, church, civic), events that have obtained a temporary use permit for a public event, and church fund-raisers. These signs do not refer to grand openings, special sales or promotional sales. A permit, with no fees, for event signs must be granted by the Zoning Officer at least seven days in advance of its public display. Event signs may only be displayed 14 days in advance of the event. Event signs shall be removed within 48 hours after the end of the event. With the exception of directional signs erected in accordance with Subsection G, no event signs shall be placed in the public rights-of-way or within the sight triangle of any intersection. Event signs shall not exceed 32 square feet. Such signs must be placed on private property with owner's permission. No paper or cardboard signs are permitted. Directional signs for events signage located in County rights-of-way. Spacing. Signs may be located at intersections, and may include straight as well as turning movement arrows. Size. Maximum of three square feet. Location: three feet off the curb or edge of paving; no more than 30 inches in height; in no case closer than 30 feet to the point of intersection. Duration: 12:00 noon Friday until 12:00 noon Monday or the Tuesday following a federal holiday observed on a Monday. For a weekday event, the sign can be placed 48 hours in advance and removed 24 hours after the event. Number. No more than one directional sign at each approach to the intersection for each subdivision or development for which directions are being given. Content. Event name and a directional arrow must be part of the sign. The name may include a description of the type of event. Materials. Signs must be metal or plastic on a breakaway support of wood, plastic or flexible wire. No paper or cardboard signs are permitted. Sign location plan required. The permit application shall be accompanied by a sign location plan drawn to scale of not less than one inch equals 2,000 feet. The plan will show the location of the event and the number and general location of the signs. Permit fees. The fees for directional signs shall be collected in the same manner as temporary sign permits. The total square footage of signage shall be calculated by adding the sum of all directional signs approved for an event. All signs and all components thereof, including without limitation, supports, braces, and anchors, shall be kept in a state of good repair per the Charles County Building Code, as amended from time to time. 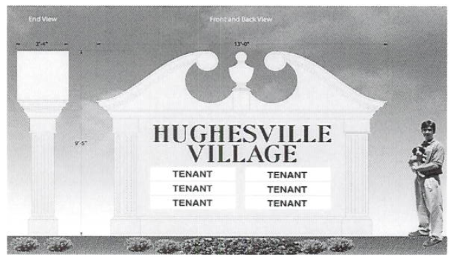 If the message portion of a sign is removed, leaving only the supporting "shell" of a sign or the supporting braces, anchors, or similar components, the owner of the sign or the owner of the property where the sign is located or other person having control over such sign shall, within 180 days of the removal of the message portion of the sign, either replace the entire message portion of the sign with a permit or remove the remaining components of the sign. This subsection shall not be construed to alter the effect of § 297-327, which prohibits the replacement of a nonconforming sign; nor shall this subsection be construed to prevent the changing of the message of a sign. The area within 10 feet in all directions of any part of a freestanding sign shall be kept clear of all debris. Within the right-of-way of any public street, road, or buffer yard unless the work is done pursuant to the express written authorization of the County or other agency having jurisdiction over the streets. On property that is not under the ownership or control of the person doing or responsible for such work, unless the work is done pursuant to the express authorization of the person owning the property where such trees or shrubs are located. In any area where such trees and shrubs are required to remain under a permit issued under this article. Subject to the restrictions of this section, nonconforming signs that were otherwise lawful on the effective date of this article may be continued until they are required to be removed under § 297-326. Nonconforming signs may not be enlarged or altered in such a manner as to increase the degree of nonconformity; nor may illumination be added to any nonconforming sign. A new business/use shall not move or replace a nonconforming sign except to bring the sign into complete conformity with this article. If a nonconforming sign is destroyed by natural causes, it may not thereafter be repaired, reconstructed, or replaced except in conformity with all the provisions of this article, and the remnants of the former sign structure shall be cleared from the land. If a nonconforming sign other than a billboard advertises a business, service, commodity, accommodation, attractions, or other enterprise or activity that is no longer operating or being offered or conducted, that sign shall be considered abandoned and shall be removed within 365 days after such abandonment. The advertising copy paid by a party other than the sign owner, or promoting an interest other than the rental of the sign has been removed. Any other criteria of the National Register. Notwithstanding the other restrictions contained within this article, the following provisions only apply to real estate signs. Signs requiring neither permit nor payment of a fee. Real estate signs without illumination, containing the message that the real estate on which the sign is located (including buildings) is for sale, lease, or rent together with information identifying the owner or agent. Such signs shall be removed within 14 days after sale, lease or rental. In residential zones, such signs may not exceed six square feet in area and shall be removed immediately after sale, lease, or rental. A single sign on each street frontage may be erected. In all zones other than residential, such signs may not exceed 32 square feet in area. Off-premises signs announcing open houses for real estate sales or rentals shall be permitted, provided that the owner's permission is obtained prior to the posting of such sign, they are located outside of the public right-of-way, and the sign is no larger than four square feet. Such signs may be posted after 12:00 noon on Friday and must be removed by 12:00 p.m. the following Monday. No more than four signs shall be permitted for any one house. Signs requiring permit but no fee. A permanent single sign not exceeding 32 square feet in area, identifying only the name and street number of an apartment house or complex, or residential subdivision, may be erected on the premises or the building itself. To ensure that traveling motorists can see and identify the subdivision, additional signage may be permitted not to exceed two signs with a total sign area of not more than 64 square feet. Signs requiring permit and payment of a fee. Temporary identification sign. During development and sale of a subdivision or other property, one temporary sign naming the subdivision and other pertinent sales information, having an area not exceeding 64 square feet and a height not exceeding 16 feet, shall be permitted in the subdivision or other property. If the development has multiple street frontages with a vehicular entrance, one additional sign of equal size shall be allowed on the premises and situated at the additional street frontage with a vehicular entrance. Temporary directional signs, indicating the location of a real estate subdivision. Such signs, not exceeding a total of 64 square feet in area, may be erected within eight street miles of the subdivision site. A maximum of four such signs are permitted, and each sign shall be located not less than 15 feet from the nearest edge of a public right-of-way and at least 100 feet from the nearest curb intersection of any streets or roadways. The top of the sign shall not exceed 16 feet above grade. The content of such sign shall be restricted to the name of the subdivision and other pertinent sales information. A temporary real estate sign shall be removed upon completion of the project or when sold or leased. Content. Subdivision or development name and a directional arrow must be part of the sign. The name may include a description of the type of development. Sign location plan required. The permit application shall be accompanied by a sign location plan drawn to scale of not less than one inch equals 2,000 feet. The plan will show the location of the development and the number and general location of the signs. Permit fees. The fees for directional signs shall be collected in the same manner as temporary sign permits. The total square footage of signage shall be calculated by adding the sum of all directional signs approved for a single residential development.